Lakes region than along the coasts. Instead of dealing with sea level rise, we face higher temperatures and more high heat days. According to the Great Lakes Integrated Sciences and Assessments Program (GLISA), temperatures are rising three times faster in Cleveland than elsewhere in the US. We also face an increased number of heat waves, increased flooding risks, and storms of greater frequency and intensity. Cleveland has social conditions and land use patterns that may exacerbate the adverse effects of climate change. At the regional level, sprawling development without population growth has led to concentrated poverty in core city neighborhoods, redundant infrastructure, an increase in impervious surfaces, and growing economic and racial segregation. 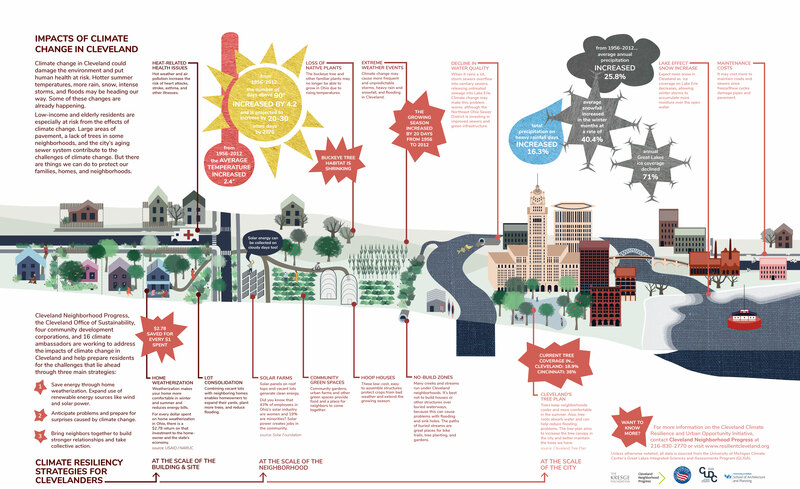 Climate-related challenges will not be experienced uniformly across the city and region. Topography, tree cover, development patterns, and social factors lead to geographically specific vulnerabilities. The Cleveland Climate Resilience and Urban Opportunity Plan includes a detailed assessment of the current and anticipated effects of climate change in the Midwest, along with mapping and analysis of Cleveland’s vulnerabilities, characterized by six social factors. The vulnerability mapping helps identify the parts of the city most likely to be at risk in the event of heat waves, heavy precipitation, or other extreme weather and will enable the city to target resources and programs to reduce risk. Building on current local efforts to address the impacts of climate change, the plan details the Cleveland Climate Action Plan (CAP), Neighborhood Climate Action Toolkit, and Cleveland Climate Action Fund. It advances the recommendations of existing neighborhood initiatives, such as the city’s Complete & Green Streets ordinance, and the Re-imagining a More Sustainable Cleveland plan for vacant land reuse. It also aligns closely with the on-going efforts of the Northeast Ohio Regional Sewer District to manage stormwater and reduce combined sewer overflows into Lake Erie from Greater Cleveland. – Who needs to be concerned? Cleveland Taking Climate Action (2013) from Sustainable Cleveland on Vimeo. Slavic Village: As the neighborhood at the epicenter of Cleveland’s foreclosure crisis, Slavic Village has many vacant houses and vacant lots, along with a high concentration of low-income households. Neighborhood assets include excellent transit and bike infrastructure and on-going programming that promote active lifestyles. Central-Kinsman: Perhaps the most distressed neighborhood in the city, Central-Kinsman has a high poverty rate; many abandoned buildings, vacant sites, and brownfields; and a sparse tree canopy. The neighborhood is home to one of the city’s two eco-districts. It has a strong community development corporation with innovative programs to increase food access/food security and reduce public health disparities. The Cuyahoga Metropolitan Housing Authority has made significant upgrades to public housing in the neighborhood in recent years. Glenville: This neighborhood has some of the oldest housing in the city, including grand mansions, multi-family buildings, and small houses, along with pockets of new residential development. The neighborhood has highly engaged residents who meet at regularly scheduled Network Nights in order to advance local projects and address emerging concerns. Detroit-Shoreway: This neighborhood is economically diverse, including some of the poorest and most affluent households in the city. It has excellent transit access and a thriving cultural district. It is home to the city’s other (and original) eco-district.